• You can make the plot larger or smaller. • You can zoom in on a portion of the plot. • You can get the coordinates for any point that was plotted to construct the plot. • You can get the coordinates for any location within the plot.The rest of this section shows how to use these features. • Press and hold down the mouse button and move the mouse in the direction in which you want the polar plot’s dimensions to change. • Once the polar plot is the right size, let go of the mouse button. 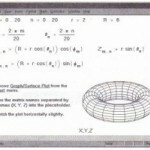 • Click outside the polar plot to deselect it. • Choose Graphee.Zoom from the Format menu, or click on the Zoom button in the Graph Palette. 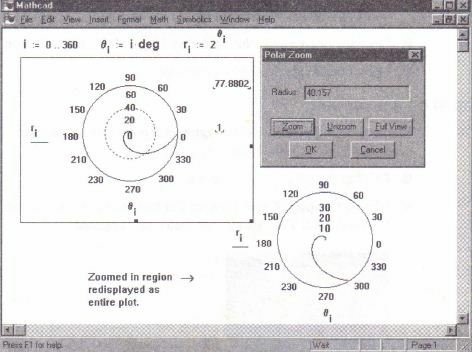 The Polar Zoom dialog box appears. • If necessary, reposition the Polar Zoom dialog box so that you can see the entire region of the graph you want to zoom. • Click in the polar plot region and drag the mouse while holding down the mouse button. 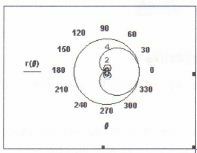 A dashed selection circle is centered in the plot. • When the selection circle just encloses the region you want to magnify, let go of the mouse button. 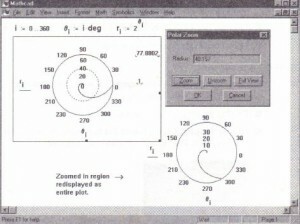 • The radius of the selected region is shown in the Radius box of the Polar Plot Zoom dialog box. 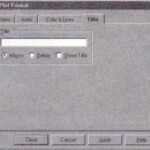 Click the “Zoom” button to redraw the plot. The axis limits are temporarily set to the coordinates specified in the Polar Plot Zoom dialog box. Before you make these axis limits permanent, you can select another region to zoom by enclosing another selection circle around the new region. Click “Unzoom” to start the zooming process over. If you’re working with a plot that has already been zoomed, you may want to view the original plot as it looked before any zooming took place. To do so, click on “Full View”. A zoomed-in region of a polar plot.